The mint Gracie Camera Bag from Jo Totes can be used to hold your photo gear or as an everyday bag. With its capacity for your DSLR system, iPad-sized tablet and accessories, a total of seven pockets provide storage space. Four removable touch fastened dividers help you configure the interior. The exterior has two front magnetic button accessory pockets with buckle accents, front and rear zippered pockets and a quick-access open rear pocket. A full-length zipper provides access to the inside. A zippered iPad-sized tablet pocket is on one side while a smaller zippered pocket on the other side is for personal items. The Gracie has a mint water-resistant faux-leather exterior and light gray cotton interior. The lining is sewn with foam on all sides and bottom as well as extra padding within the main 2/3 of the bag. Four metal feet protect the bottom when it is placed on the ground. Carrying options include removable, adjustable shoulder and cross-body straps as well as a removable shoulder pad. Box Dimensions (LxWxH) 14.8 x 7.4 x 6.1"
Gracie Camera Bag (Mint) is rated 4.7 out of 5 by 48. Rated 3 out of 5 by nanilani from Cute but Uncomfortable I was looking for a camera bag to use while traveling: roomy enough for my photo gear and guidebooks etc., cross-body for better weight distribution, and not your typical camera bag styling so as not to attract pickpockets. After lots of research this bag seemed to be the answer, but I've found it to be too uncomfortable to carry all day. When I adjust the strap so that the bag hits at my hip, the buckle ends up at my neck and the weight causes it to dig in (I'm 5'3). No camera bag will be very light, but the padding is lacking on this strap. Otherwise the bag is nice with plenty of pockets and colorful faux leather. Would be better for casual use than as a cross-body. Rated 5 out of 5 by AL from Great bag This is the bag I take when I'm traveling or shooting street photos. It holds a DSLR with lens attached, as well as two other lenses (or a lens and a flash), a compact and a tablet. There are several pockets for accessories, phone, wallet and other stuff. About the only thing it doesn't hold is a tripod. The only drawbacks for me are that it gets heavy when loaded with gear and the cross-body strap doesn't balance the weight like a backpack would; also, I am petite and sometimes the bag feels too large for me. In general, though, the bag suits my needs, and is perfect doubling as camera bag and purse. Rated 5 out of 5 by Jackie from Beautiful bag! I have been eyeing a Jo Totes bag for a long time and I'm so glad I finally took the plunge and ordered this one! The color is absolutely gorgeous and is so spacious! I can fit all my essential camera gear and still have room for my personal items. It looks like a nice roomy purse but has the added benefit of substantial padding to protect my camera and lenses. I love that it comes with a long strap and also a shoulder strap. Makes the bag that much more versatile. The exterior is not stiff but does maintain its shape. Even with my bag full of lenses and camera body there is still plenty of room for items on top like a wallet or other items. It's the best camera bag I've ever owned! Rated 5 out of 5 by Beth T from Stylish, Deep Camera Bag I received my gracie bag about a month ago and I love it. I wanted a bag that could give me more room than my Nikon shoulder bag. I wanted to put my keys and wallet in there and not worry about it falling out. There's plenty of extra pockets for keys,money and things of that sort. I can fit my Nikon D810 with my 50 mm lens attached, a 16-35mm, 85mm lenses and my Nikon SB 700. That's only in the main compartment. I can fit my iPad mini and wallet in the inside side pockets and then my keys, glass cleaner and a couple other little odds and ends in the pockets on the outside of the bag. All of that fits in this one bag. It's a heavy bag with all the equipment in it, but totally manageable to me. Rated 5 out of 5 by mnphotographer from I love this bag! I love love love this bag! The color is perfect, definitely has a little tint of green in it than the picture makes it look. It's super comfortable even with three lenses and a camera body in it.Lots of extra pockets for little notepads, batteries, memory cards, chargers, phones, and everything! It is a pretty big bag, but I love it! Rated 5 out of 5 by A. Williams from Perfect bag I love this bag and it is perfect for me. I needed something that would allow for me to hold several lenses, and have them easily accessible to me. I needed a bag that would hold a 70-200, standing up (along with additional lenses). I also wanted a bag that would allow me to house my camera body, with grip and lens (standing up). I wanted to be able to hold other lenses in the bag while doing so. This bag does, and holds everything I need and more! Every bag I found (not to mention more expensive) could give me one or two of the functions I was looking for, but never all of them, much less surpassing them. It has 5 removable Velcro inserts. Your possibilities are numerous in how you can arrange your equipment/items. I am able to fit my iPad with cover in one of the inside zippers. In the other inside zipper I put my personal items such as keys, lip gloss, tissue, pens, hand sanitizer, etc. This pocket is not as deep, which I like, b/c I'm not looking for those little items way down under the equipment. The front outside zipper holds things like my SD card case, white balance card, and anything else I might come in counter with that is of importance, that I might need easy access too, but want it secured. I use the two outside pockets to hold my phone, business cards, lens cleaner pen, batteries, etc. These pockets are secured by a strong magnetic closure. These pockets are about as tall as an iphone5 (mine stands up straight and has no problem being closed over, in fact has a little room to spare. These pockets were deceiving! They hold more than I thought, and are sturdy! There are two outside, back pockets. At first, it looks like only one unzipped pocket, but then inside that pocket is an additional zipped pocket. I put important paperwork in the zipped pocket, and my lens caps in the unzipped pocket. These two pockets are pretty deep also. Lastly, this bag comes with two shoulder straps and a shoulder pad. I can't tell you what an awesome deal this is! As a wedding and on-location photographer, the crossbody strap is what I use most. I use the regular shoulder strap when I am using the bag for vacation, and regular outings. The included shoulder pad is such a bonus. I didn't realize how much I would need it until I used the bag for the first time, not paying attention to where it lay, until the metal adjusting part of the strap left a bruise on my collar from laying in the same spot, weighted down, for 8 hours. LOVE that shoulder pad. 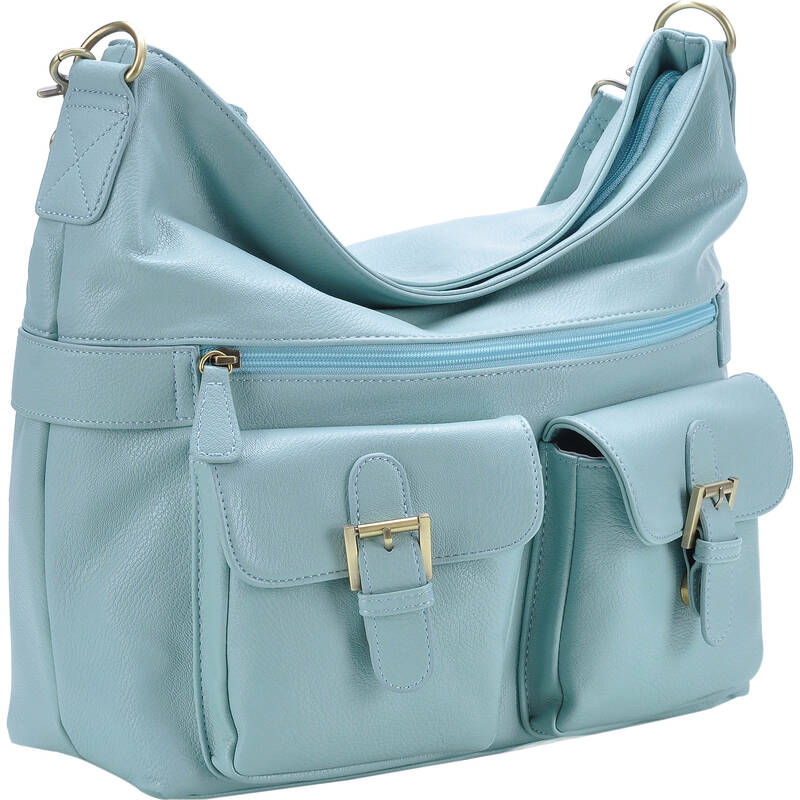 The mint blue is the perfect pastel color, and the bag in its entirety definitely looks like a regular purse, rather than a full functioning camera bag! Oh! and I love the little metal feet on the bottom, allowing it to stand up nice and straight (even with my 70-200!) and keeping the bottom cleaner! Rated 5 out of 5 by Carol R. from PERFECT CAMERA/TRAVEL BAG I Purchased this bag originally as a carry on travel camera bag for my trip to Florida. It's absolutely perfect for this. I have my Nikon D3200 with lens, an extra lens, iPad, luggage scale and bathing suits (in case my luggage gets lost) in the main compartment. Front pockets have my GPS and camera accessories in them. This bag is so wonderful that while in Florida and after I return home I will use it as my everyday purse. I would never take my camera with me because it was a hastle to carry an extra bag but now, everything will be with me. Love the color. So glad I found this product and B&H website by fluke while I was searching for camera bags. I was nervous having this bag shipped to Canada but B&H took care of all the Customs/cross border issue for me for a minimal fee. Rated 3 out of 5 by Kathy from Great except strap clips have broken twice If it weren't for my strap issues, I would give this 5 stars. However, the clips that attach the strap to the bag have broken twice. The 1st time I was running to catch my plane in Bangkok. The clip broke & my bag w/ Nikon DSLR & 50mm lens fell to the tile floor. Once I landed, I bought a bungee cord to tie the strap onto my bag for the rest of the trip; I should have bought 2 cords for the remaining clip also broke. I contacted the manufacturer who sent another strap. After a month with the new strap one of the clips broke. As this bag is supposed to hold a DSLR kit, it should be able to withstand what I carry--a Nikon D610 w/ 28-300mm lens, a reporter's notebook, 3 pens, box of Altoids, my ID and occasionally an extra 50mm lens. Obviously, it can't. This is a shame for the bag itself is well padded, has many handy pockets and doesn't look like a clunky camera bag. Will this bag fit a Canon 6D camera with 24-105mm lens, as well as a water bottle and large wallet? Yes, you can fit all those items in the Jo Totes Gracie Camera Bag. will this fit a laptop in it along with a camera and lenses? Depending the size of your camera body and the lenses that you're using you could fit a SMALL laptop or iPad in the bad. With removable dividers you can configure this bag to your specification. I don't put my laptop in my bag as I use it for camera and other travel stuff as I use it as my carry on bag when flying. I LOVE my bag and recommend it. is the shoulder strap cushioned? Will it fit D7200 with Tokina 11-20mm lens and a Nikon 18-140mm lens? I can fit my Nikon 7100 with Nikkor 18-300 attatched, and a Tokina 11-16 in the bag. Can this bag fit a 70-200? Yes. I can fit my Nikon d7200 with 70-200 attachehd. It's a tight fit, but it is the reason I selected this bag. The interior is quite roomy. It come with Velcro dividers so that you can customize it to your needs. I use my bag as a my carry on when flying and it stores my Nikon camera, iPad, extra batteries with charger and I also put a bathing suit on top in case my luggage is lost. Highly recommend this bag. I would say not mint at all. More of a baby blue. I was a little disappointed, as I was looking for more mint/turquoise color, not baby blue. Love it otherwise. can bag fit a 70-200 lens?